Each month Geeky Giving will produce a bundle of exclusive short stories and novellas. These science fiction and fantasy books by your favorite authors will only be available through Geeky Giving, and 100 percent of the money we raise goes directly to BarrowNeurological Institute to research cures for Alzheimer’s, ALS, brain tumors, Parkinson’s Disease and more. At the end of this the project we plan to create a complete anthology of all stories with a special capstone story not available anywhere else. Print and e-book copies will be available. Geeky Giving February 2016 Book Bundle will be available starting Feb. 22, 2016. It will be delivered as our thank you for making a donation of at least $5. Know you’re going to want all four bundles? A $25 donation to Barrow scores you every monthly bundle. Would you love to read these stories? Securing your copy of the Geeky Giving February 2016 Bundle is easy. 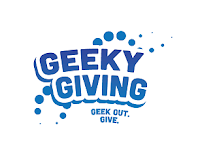 Make a donation to the Geeky Giving project any amount over $5, and then follow the instructions in your confirmation email to receive your digital book. Epub and mobi formats available and will be delivered within 48 hours of receiving your confirmation email. The February bundle will be available as our thank you for donating through March 20. After that time, we’ll begin offering a new awesome set of stories from another group of talented authors. But never fear, there’s an alternate way to score the February bundle. Donate at the $25-plus level and we will send you each of our four planned monthly bundles as they become available. If you’re late to the party, we’ll make sure you receive any you missed. Donations are not required to enter. Please visit the swag page for full details and rules.